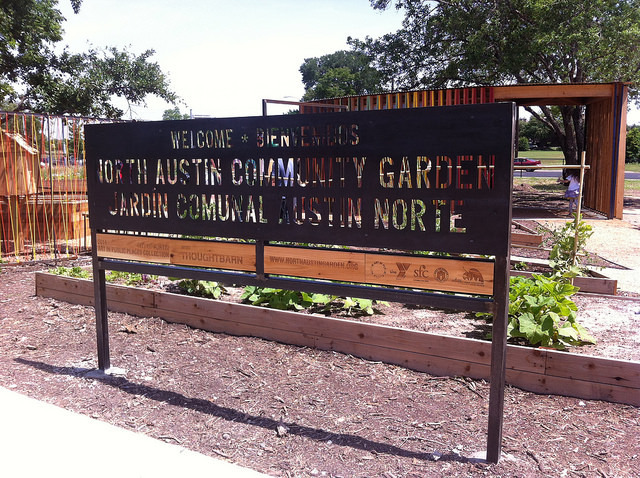 North Austin Community Garden is a partnership between the City of Austin and YMCA of Austin. 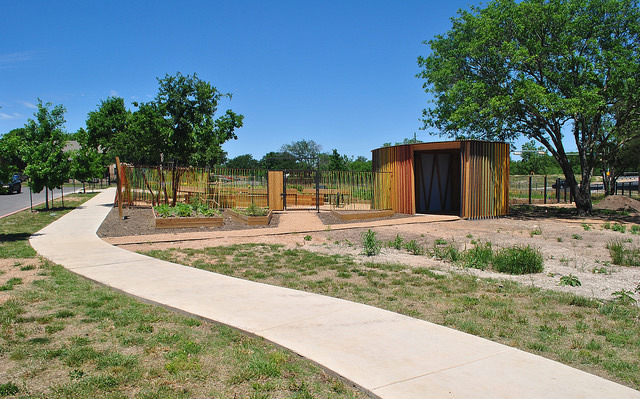 Local artists Lucy Begg and Robert Gay of Thoughtbarn were commissioned by Austin’s Art in Public Places program to design and build the garden. Although the garden only opened recently, the community’s response has been overwhelmingly positive and plans to expand the garden are already in the works. The plan for North Austin Community Garden (NACG) was proposed by the city government of Austin, Texas in 2012. The community garden was a component of the new North Austin Community Recreation Center, a public/private partnership between the City of Austin and YMCA of Austin. As mandated by Austin’s Art in Public Places Ordinance, any City-funded capital improvement project over $100,000 must allocate 2% of its budget for public artwork. While working on the recreation center project, Art in Public Places staff noticed that the site plans for the recreation center included a space for a “future community garden.” They saw this as an opportunity to incorporate an innovative public art project into the new facility. The NACG is the city’s first artist-designed community garden and is regarded as both a community gathering space and a work of art. The idea of city-planned community gardens is gaining popularity across the country. Coincidentally, as the Art in Public Places Program began contemplating artist involvement in the community garden, the City of Austin’s Parks and Recreation Department created the Sustainable Urban Agriculture and Community Gardens Program. This new program promotes and creates urban agricultural sites and community gardens, essentially creating a formal outlet for the city to continue planning projects like the NACG. To support the Art in Public Places Program’s focus on the artistic aspects of the garden, the NACG team decided to commission a local artist to design and construct the garden. They were looking for someone who had previous experience with building public structures, but most importantly, they wanted someone with experience executing projects that emphasized community involvement. After a competitive artist selection process and vetting process, the Art in Public Places program commissioned artists/architects, Lucy Begg and Robert Gay, a husband and wife team who direct an Austin-based design studio called Thoughtbarn. Their portfolio included numerous public art projects, and their commitment to community engagement made them an excellent match. During the course of the project, the artists worked extensively with the local community, through workshops and public events, to develop the design of the garden. They also established the Garden Leadership Group, now led by community volunteers, to develop a governing structure and bylaws, including membership rules and fees. In addition, three Community Participation Days were held during the garden’s construction: one day to build the fence, another to build the garden beds, and the last to prepare the garden for the public opening. 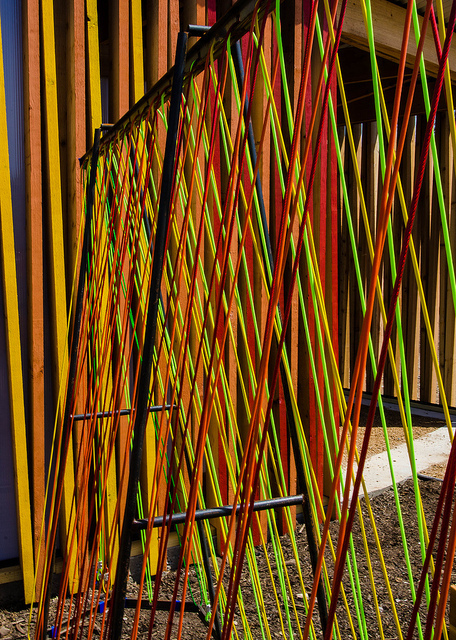 The construction of the fence was an important component to Thoughtbarn’s design of the garden; not only is it utilitarian and visually interesting, but it also offered the community an opportunity to contribute to the artistic creation of the garden. 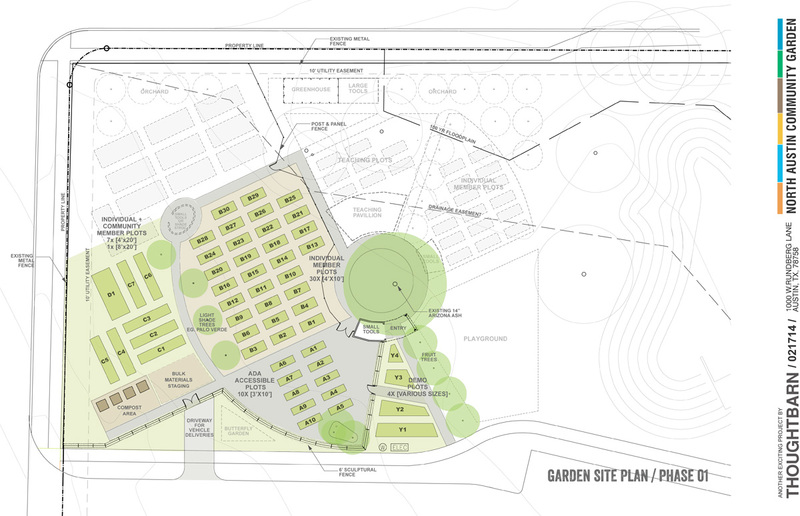 The garden’s first phase of construction is now complete, but future building plans include a teaching pavilion with accompanying plots, a playground, additional member plots, and a greenhouse. NACG leaders host workshops such as “Square Foot Gardening” and in conjunction with Sustainable Food Center, hopes to host art classes once the teaching pavilion is open. Community response in general has been overwhelming- when the garden opened applications for member garden plots, they were sold out within hours. 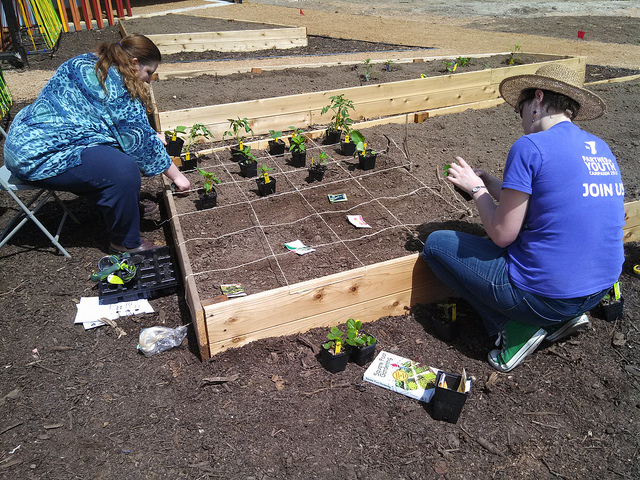 The community of North Austin has wholeheartedly embraced their new garden. The city is confident that the community has the tools and the passion to be successful in growing this garden for years to come. -Story written by Ashlie Flood, Smithsonian Gardens 2014 Katzenberger intern, with contributions from NACG. A view of the newly built fence and shed, newly planted trees, and some planters located on the exterior of the North Austin Community Garden. © Art in Public Places Program, 2014. 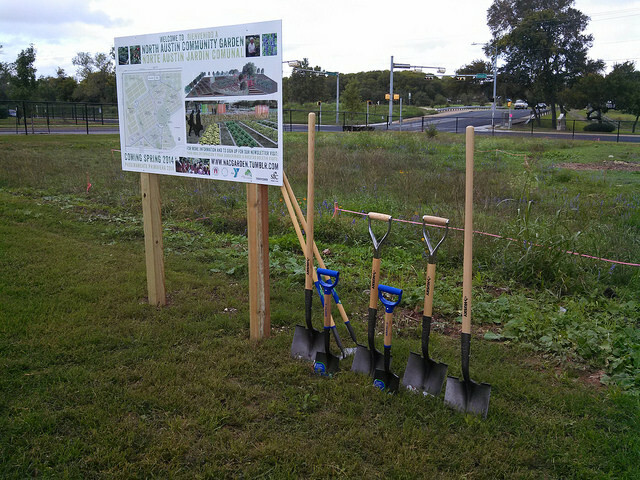 After over a year of planning, collaborators on the North Austin Community Garden project broke ground on October 27, 2013. This was the design proposed by artists Lucy Begg and Robert Gay for the North Austin Community Garden. The colored parts of the plan have already been built, and the gray sections are future plans for the rest of the garden. © Thoughtbarn, 2013. “When people see this beautiful garden, how can you not be inspired to make something else beautiful? It’s a living piece of art.” –Sharon Mays, Garden, a Flow Nonfiction documentary. © Philip Rogers, 2014. Visitors admire the individual plots of the North Austin Community Garden on their Grand Opening day. © Philip Rogers, 2014. 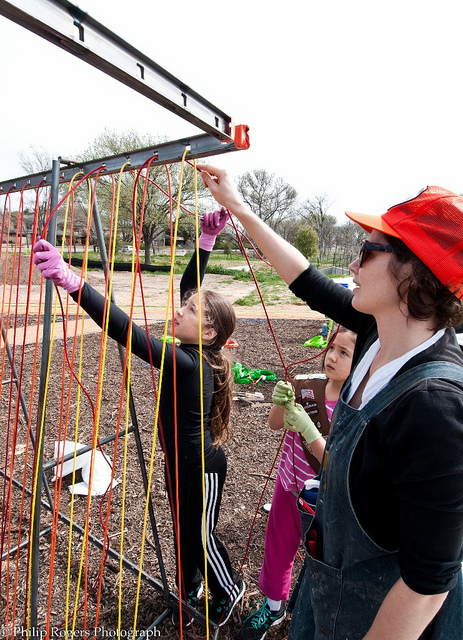 During the first of three Community Participation Days, members of the community helped string wire to construct the colorful garden fence. © Philip Rogers, 2014. On the second Community Participation Day, volunteers helped build and move dirt into the garden beds that will be used as individual member plots, despite the rain.© Philip Rogers, 2014. In the first of many workshops to be held at the NACG, community members demonstrate the technique of “square foot gardening.” © Philip Rogers, 2014.